It’s a sign of the season, and a beloved family tradition. 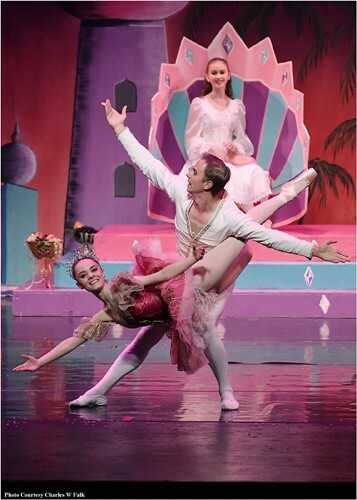 “The Nutcracker Ballet” will be presented by Kingwood Dance Theatre in the Atascocita High School Theatre Saturday and Sunday, Dec. 2 and 3. For the past 30 years, the theatre’s full-length production, with extensive sets and costumes, has brought the story of Clara and her Nutcracker Prince to life. A cast of more than 100 dancers and performers will fill the stage with mice and soldiers, mechanical dolls, snowflakes, the Snow Queen and the Sugar Plum Fairy. A gliding sleigh, magical trunk and falling snow add to the enchantment of the ballet set to the well-known music of Peter Tchaikovsky. This year’s production will feature Keira King as the Sugar Plum Fairy and guest artist Andre Prikhodko as the Prince. Madison Ripp will perform as the Snow Queen. Annie Shupak and Emma Monsen will share the role of Dew Drop. The role of Clara will be shared by Libby Peck and Celine Moutier. Kingwood Dance Theatre’s performances are Saturday, Dec. 2 and 3; tickets are $20 and may be purchased online at kingwooddancetheatre.com. Tickets will also be sold at the theater box office on the day of the performance. The box office will be open one hour before curtain. Area Scouts may be interested in the badge-earning program, which includes a tour backstage after the performances. Atascocita High School is located at 13300 Will Clayton Pkwy. For more information or to order tickets, call 281-358-4616.